Soon you'll be hearing a lot on the blog about the JLPT - the Japanese Language Proficiency Test, or Nihongo Nōryoku Shiken. It's held once a year in December, and this will be my third year taking the test. For all my years in school, I've always been abysmal at rote memorization and my test-taking skills are embarrassingly poor. While I enjoy learning, I don't enjoy studying, and forget very quickly. 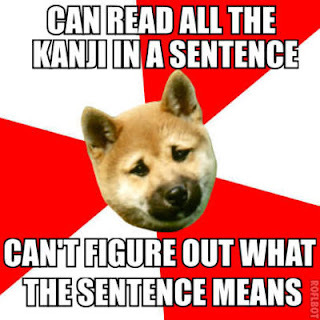 This is how not only am I not fluent in Japanese after two years of formal education, three years living there and another two years with a personal tutor, but my kanji skills are comparable to a second-grader's. Yet I am someday determined to work my way up to level N2 of the JLPT. The test has five levels, starting with N5 (the easiest, I could have passed this had I taken it when I was in university) and going up to N1 (Japanese people cannot read some of the kanji on this test). The "N" (for "New") levels came in in 2010. Prior to that, there were only 4 levels, with an enormous difficult gap between 2 and 3. I tested for level 3 in Osaka and passed it. Under the new system, that's technically "N4," so last December I wrote N3. I missed the pass mark by just a few points. So this year it's back to the grind. I started studying quite late last year (September, for a December test, with National Novel Writing Month right in the middle! ), so my friends and I are hoping to meet for our study group once a week from now until summer's end, and then twice a week after that. And we will be ready! Yes! So here's a little self-intro I wrote to get in a little practice. Grammar is my worst point after kanji. Figures!